Missing from the coverage of the war in Libya has been any discussion as to what the end goal is. Yes, there has been a lot of talk, although little consensus, about what should happen with Gaddafi. But what about Libya itself? When the coalition partners involved in the mission in Libya ask themselves “where do you see Libya in five years” what is their answer? What is the international community trying to achieve, and more importantly what is possible to achieve? Is the aim to have the current rebels controlling the country? Perhaps a leader, handpicked by the coalition powers, will be chosen to oversee a transition to democracy? 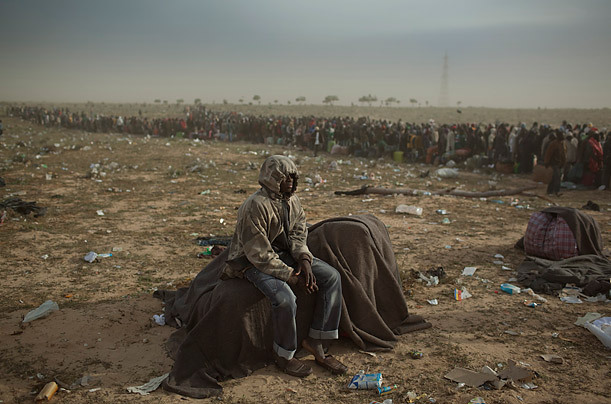 Lost in the midst of the chaotic and equally ambiguous mission in Libya are questions regarding what happens when the bombing ends. The conventional wisdom of conflict resolution suggests that only a negotiated settlement between the rebels and the pro-Gaddafi factions can guarantee peace. That may clash with another goal of the mission: justice. It is an accepted truism amongst scholars and practitioners of conflict resolution that unless there is a clear victor in an armed conflict, a negotiated peace agreement is necessary. Conflicts that end in negotiated agreements, rather than military victory by one party, tend to include provisions for power-sharing between the conflicting parties. The hope is that power-sharing can reassure previously conflicting parties about key issues concerning the control of and access to economic resources, political power and security. It is argued that power-sharing is particularly necessary where the social fabric of a society has particularly sharp ethnic, religious, regional, or other, tensions. In a recent paper, Power-Sharing and Transitional Justice: A Clash of Paradigms, Stef Vandeginste and Chandra Lekha Sriram (2011) argue that the paradigms of post-conflict power-sharing and accountability clash. Where conflicts have included mass atrocities, a typical response has been to grant amnesty laws or offer exile to perpetrators as an incentive to continue the process of negotiating peace. A problem arises when attempting to provide a place for justice in power-sharing agreements. The problem is exacerbated because, as Michael Scharf notes, it is unrealistic to believe that a party would cease hostilities if “they would find themselves or their close associates facing life imprisonment.” For some, like Jack Snyder and Leslie Vinjamuri, this reflects the rather uncomfortable reality that, for some, the perpetrators of atrocities may sometimes be “indispensable allies” in the pursuit of peace. Let’s apply the theory to Libya. The past few weeks have shown that Gaddafi retains a remarkable, perhaps surprising, level of support within Libya. 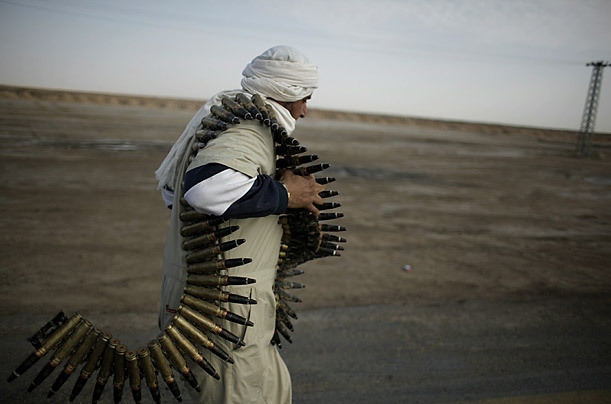 The result, as characterized by The Economist, has been constant “see-sawing” in the fighting between pro-Gaddafi forces and the rebels. 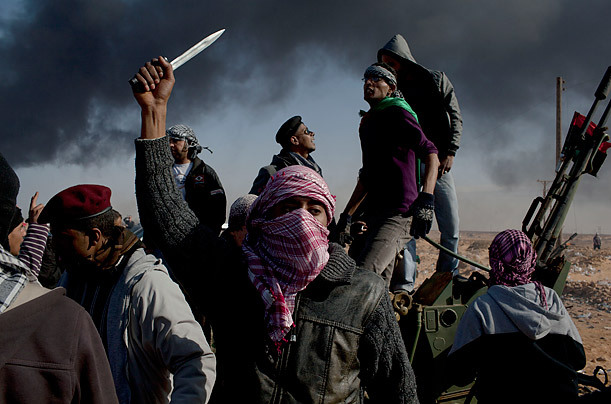 The divisions within the social fabric of Libya are clearly profound and, according to some, the outbreak of war along tribal lines remains a distinct possibility. While it’s difficult to ascertain where it derives and how strong it is, it does appear that Gaddafi retains significant levels of loyal support. Meanwhile, there are reports that the US and others are seeking states to offer Gaddafi asylum. Uganda recently declared that it would welcome Gaddafi. Putting aside the problem of laying blame at the feet of the ICC rather than the UN Security Council, the argument, on some level, is compelling: why would individuals like Gaddafi negotiate an agreement which delivered them to the Hague? They wouldn’t, the argument goes, and instead will have every incentive to continue committing atrocities. The problem is, there’s no real evidence of this. Indeed, some suggest that investigations and indictments may, in fact, provide incentives to negotiate. Take the case of the ICC’s involvement in the situation in northern Uganda for example. The ICC was heavily criticized for issuing arrest warrants for senior commanders of the Lord’s Resistance Army (LRA), including the notoriously brutal Joseph Kony and Vincent Otti. Criticism centered around the Court being an external imposition that risked undermining a fragile peace process between the LRA and the government of Uganda. There was widespread support in civil society for the granting of amnesty to individuals in the LRA as an incentive to lay down their arms and reintegrate into society. Then something unexpected happened. The LRA became more engaged in the peace process than it previously had been. A round of negotiations were set up in Juba, South Sudan in 2006, just a year after the arrest warrants for Kony and others were issued. Some have called this the best opportunity in twenty years to finally establish peace in northern Uganda. Eventually, in 2008, the Juba peace talks failed. Some observers placed the blame on the ICC. But it remains unclear what the role of the arrest warrants was in the failure of the negotiations. Regardless of what commentators may suggest, it is not obvious how ICC arrest warrants affect the behaviour of individuals like Gaddafi and Kony. However, it may be just as likely to give them the incentive to negotiate their immunity, exile or asylum as to “fight to the death”. None of this is to defend the ICC or its involvement in all contexts. But in the presumptuously labelled “peace versus justice” debate, there’s a need to balance claims and counter-claims, to contrast competing versions of events, and to compare experiences across cases. There may be tensions between the pursuit of peace and the pursuit of justice but they are more murky than clear. Our understanding of these tensions is only hampered by simplistic narratives, however compelling or intuitive they may be. Remarkably, no commentator to date has considered that the real clash of simultaneously pursuing justice and peace in Libya is not the result of some simple notion of conflict resolution as a bargaining process. Rather, it derives from the reality that a power-sharing agreement may be necessary and, at the moment, Gaddafi is the only one to negotiate with in Tripoli. This brings up some uncomfortable realities. If not with Gaddafi himself, then the rebels and the international coalition behind them will have to negotiate with those who remain loyal to him. It is simply unfeasible for the prospects of peace in Libya that pro-Gaddafi factions are barred from the peace process. That may only create powerful spoilers of peace. There may only be bad options to ensure that Gaddafi isn’t at the other end of the peace negotiation table with the rebels: his death or a deal that includes impunity and exile/asylum. Neither would be justice and one necessarily includes a round of direct negotiation with Gaddafi. Hope that Gaddafi would be deserted by all of those loyal to him have turned out to be just that: hope. 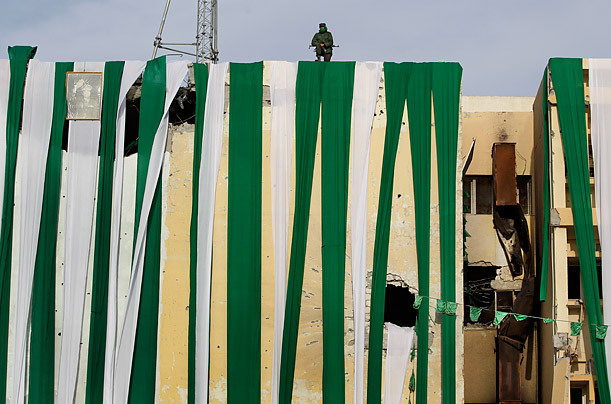 The international community is rightfully non-committal to targeting Gaddafi. 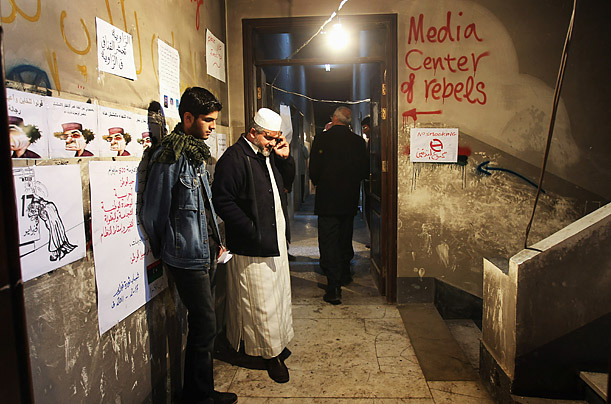 However, by doing so they are left with one option: negotiating Gaddafi’s departure. This is evidently being considered as a “necessary evil”. The debate about the relationship between peace and justice remains dominated by simple narratives. We are told that either there is “no peace without justice” or that there is “no justice without peace”; either we are good and moral and thus support accountability everywhere, regardless of context or consequence, or we simply must sacrifice accountability because it plays second fiddle to peace. But it just isn’t that simple and Libya is teaching us this lesson once again. This entry was posted in African Union (AU), Amnesty, France, Human Rights, International Criminal Court (ICC), Libya, Libya and the ICC, Lord's Resistance Army (LRA), Peace Negotiations, Transitional Justice, Truth Commission, Uganda, UN Security Council, United Kingdom, United States. Bookmark the permalink. Hi, you are trying to make sense out of the Libya situation on the basis of previous situations. That makes sense – but you got some of your facts wrong. Chiefly, you overestimate the support Gaddafi has in Libya. Sure, you can find some people who support him – but just about anyone in Libya who knows fully what is going on will not kill their fellow citizens for Gaddafi. The military support Gaddafi does have comes largely from mercenaries, along with a long established security force composed of anything but the average Libyan citizen. There is really only one side in this conflict, as far as the general population of Libya – and that is the Libyan people. Gaddafi, along with his immediate family, his security forces, and mercenaries he has hired for this particular situation, are simply trying to kill off the Libyan people – carrying out Gaddafi’s policy of killing anyone who dares speaks out against him. And this means killing off the vast majority of the Libyan people. So conflict resolution norms do not apply. You have a man, in Gaddafi, who will, until he is stopped, continue to kill off all his people. There is no other way to stop the killing other than to get Gaddafi out of power, along with his family. It is true that one solution is for Gaddafi to leave Libya. In this case, justice might never be served – but at least the killing would stop. I can’t speak for the Libyan people – but I would bet that if the killing could stop tomorrow, they could live with Gaddafi being sponsored by a foreign country to go into retirement. Under the condition of course that the government that takes him keeps him under tight enough security that he – and his family – can’t reach out from their new home to cause any further trouble. How do you get Gaddafi to leave? Yes, some country has to offer him asylum – but the rest of the world has to militarily drive him out of Libya. I doubt it would take that much effort to do so – if the world was united in their goal. Considering that pretty much all the citizens of Libya would stand up and fight against Gaddafi, if given half a chance – all it would take is a concerted effort on the worlds part to directly support the people of Libya in freeing up their own cities. Not just airstrikes to cause a stalemate – but airstrikes called in by “boots on the ground.” Accurate airstrikes called in precisely by spotter teams on the ground. No errors has to who gets targeted. Unmerciful airstrikes and pounding naval artillery. The more unmerciful – the fewer Libyans die in the attacks. Because if the attacks are conducted in a serious manner – attacks would not be needed for long as anyone still supporting Gaddafi would soon be running. So the basic question is – who wants to do the right thing – get rid of Gaddafi out of Libya. A lot of countries are on the right side. And some are on the wrong side. The ones on the wrong side should be soundly scolded by the ones on the right side. But the countries on the right side have also got to act. These countries know what needs to be done, and they should do it. The political consequences can be dealt with later. 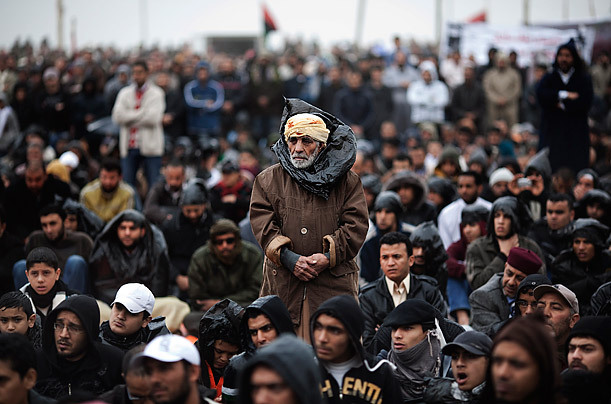 Once Gaddafi has left, and Libya returns to normal, all the facts will come out. No country, once faced with the long list of atrocities that Gaddafi is has committed, will say word one about the countries that did the right thing.